One of my first impressions of Dutch sociologist Jan Willem Duyvendak was when he bravely announced to a room full of critical urban social scientists that he loved Starbucks. In the bourgeois circles of academic urbanism, his comment seemed to draw as many smirks and self-conscious nods as winces. Perhaps it was because the audience understood the basic argument behind his point — he feels at home in Starbucks, in part because it is generic. Like Sigrist, Duyvendak recognizes that, in contemporary society, global corporations are often able to create zones of comfort and security — "hominess" of a sort — which the critical urbanists in us would prefer to think is only possible in the hyper-local and the unique. The Starbucks argument is a small piece of Duyvendak's larger struggles with the interlocking questions of home, belonging and nostalgia, the subject of his recently released book The Politics of Home. 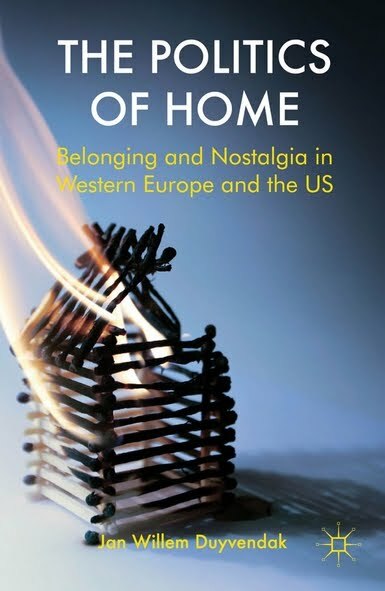 Rooted in some of the same questions as the upcoming Cambridge conference on nationalism and the city, Duyvendak is prompted to explore the question of home by the rising ethno-nationalism he is witnessing throughout western Europe. This wave constantly refers to the nation as a home under attack by "foreigners" and outsiders. As a longtime student of the United States, he noticed two other "crises" in American spaces in which the question of home is also front and center: the traditional household, where both the gender revolution and ongoing economic pressures have altered the line between work and home in ways many find uncomfortable and unsettling, and gay neighborhoods like San Francisco's Castro district, where men and women long unable to make homes in their birth communities came to establish "home" at the neighborhood scale. Along with Duyvendak's sparse and wonderfully unpretentious writing, the book's strength is this examination of one of the most basic and seemingly simple of human concepts — what makes us feel at home — along the scales of the household, neighborhood and nation. Though rooted in years of research, the book is more conceptual than overly empirical, and Duyvendak is unafraid to think through the basic spaces and places where we feel at home and how this is altered at different scales. He conceptualizes home as having three components — familiarity, home as haven (secure, safe) and home as heaven (place for self-expression, free identity) — components that mesh unevenly and sometimes problematically, producing complex places that can be both freeing and exclusive at the same time. In his short section on the Castro, Duyvendak smartly highlights that the attempt by some Castro residents to push the community beyond a familiar haven for gays and lesbians into a heaven for explicitly gay self-expression worked to exclude in a place initially founded for the excluded. Similar forces are at work in the Netherlands, where the mostly Muslim "outsiders" are excluded from the Dutch "home" in part because of allegations that they are not inclusive — of gays, women and supposedly Dutch progressive values. Ultimately, Duyvendak's heart is with the difficult question of home and nationalism in the Netherlands and with the larger questions of exclusion, belonging and nostalgia in sociology. Despite his vast credentials as an urbanist, the urban question is at times lost or underdeveloped in the text. I would be curious to hear how he reformulates his questions about heaven and haven with cities — as opposed to neighborhoods or nations — front and center. As I discussed last month, I feel at home in Amsterdam, despite the fact that I am a foreigner, but that may have to do with the fact that I supposedly share the "progressive values" being distorted in the name of exclusion. It could also be that, like many in the footloose, mobile and often privileged class that forms part of his understanding of how different people relate to questions of space, place and home, I am just very good at making myself at home wherever I am, including a Starbucks in a global city. Credits: Book jacket from Palgrave MacMillan. Billboard photo by Alex Schafran.